What is an adaptogen? The Manual Equine Herbal and Energetics describes adaptogens as any substance that increases the body’s non specific resistance to stress or disease. They help the body to adapt and normalize. When the body is over reactive they help it calm down and if under active they support to improve function. Adaptogens are so important because without them the body can get stuck in extremes on either side of the autonomic nervous system. If stuck in the sympathetic, fight or flight state, the body is not able to focus or heal from injury. The fight or flight extreme also interferes with proper digestion and assimilation of food. The Parasympathetic, rest and digest, state is also a problem if the body is not able to respond to a true emergency with an increase in metabolism and energy. Adaptogens are what help the body make these normal transitions between the sympathetic and parasympathetic states to maintain a healthy balance. Let’s look at a few well known and a few not so well known adaptogens. Eleuthero root disburses oxygen and vital nutrients to the brain and the body which makes it my primary go-to herb for the circulatory system; whether musculoskeletal or cognitive. It increases energy, endurance, longevity, and immunity, and improves skin, muscle tone and bone strength, making it an ideal herb for competition horses. It helps prevent lactic acid and helps animals recover quickly while minimizing immune depletion from intensive training. Schisandra has a uniqueness beyond other adaptogens. It has a strong impact on the central nervous system as well as the sympathetic, endocrine, immune, respiratory and cardiovascular systems. It can also help remove neurotoxins and promotes healing of existing damage in the liver, the organs of digestion, and especially the bowel which increases the body’s ability to metabolize and eliminate toxins. It also increases hepatic glutathione, an essential liver antioxidant. The lignans present in this plant work as free radical scavengers. This herb affects multiple body systems to promote emotional and physical well-being. Ashwagandha has also been shown to stimulate the growth of axons and dendrites. It prevents depletion of white blood cells, is rich in iron, enhances endocrine function with direct effect on thyroid, and is anti-inflammatory. Rhodiola rosea is helpful in maintaining muscle mass. This herb is also used for fatigue, poor attention span and decreased memory. Rhodiola helps prevent fatigue, stress and the damaging effects of oxygen deprivation. The evidence suggests that Rhodiola has an antioxidant effect and enhances immune system function. Cordyceps sinensus is used as a tonic and restorative. This Chinese fungus can help overcome general weakness and fatigue and increase physical stamina, mental energy, vigor and longevity. Milk thistle extracts have been used as traditional herbal medicine remedies for almost 2,000 years. Milk thistle contains high levels of bioflavonoids that increase immunity and slow down oxidative stress. The herb is also used for its anti-inflammatory properties. It can aid digestive function, increase bile production and help detoxify the body. Boswellia is known to reduce pain and inflammation in both the joints and tendon and ligament attachments. It is also known to strengthen connective tissue resiliency. Boswellia serrata offers many benefits, such as reducing body inflammation and helping to treat conditions like osteoarthritis and inflammatory bowel disease. It’s also a painkiller. I consider blue green algae to be an adaptogen because it provides such concentrated, wide ranging nutrition to support multiple body systems. I find horses eating the algae are happier and much better able to deal with weather related and training stress. The cannabinoid system has receptors in all body systems and the role of these receptors is to help the body maintain homeostasis. Hemp oil has, by far, more cannabinoids than any other source. By nurturing the cannabinoid system with a wide range of cannabinoids the body is much better able to respond to stress. Cannabinoid rich hemp oil is also able to relieve inflammation and pain. 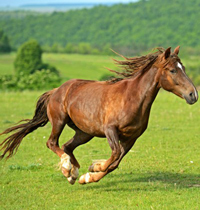 All horses benefit from adaptogens but horses under the stress of training or competition are especially benefitted. After a good foundation of whole food nutrition the addition of adaptogens will improve performance and support ongoing health. Ready to get make this the best year ever for you and your horse? Consider a nutritional consult with Dr. Ward. Or get help from one of our temperament consultants to discover your horse’s temperament type. You might even consider taking the online course and becoming a temperament consultant yourself. Then if you are ready to really get serious increasing your knowledge of holistic horse care, the Mentoring Program with one-on-one instruction with Dr. Ward may be just what you are looking for.